3. Each row of springs is tied from a single piece of twine with no breaks. 4. Springs should never end up rubbing on spring twine as it passes through them. 5. 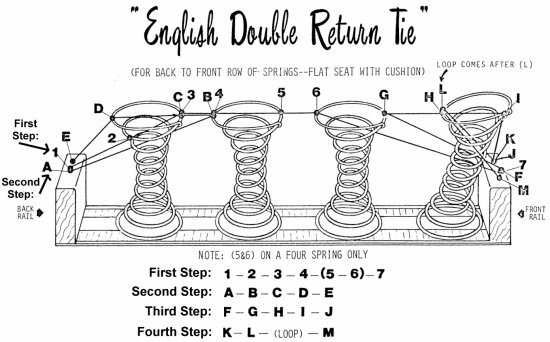 Springs should always stand straight up and down when compressed ( except for the front row of springs on a English Double Return Tie ). This is not saying , however, that the tops of the springs are not supposed to tilt. 6. Seat springs are usually tied with an average of 2" to 3" of compression. Example: A 10" tall spring will usually be tied down to approximately 8". Back springs are usually tied down an average of 3" to 4". BE SURE TO MEASURE THE HEIGHT OF THE COMPRESSED SPRINGS BEFORE YOU CUT THE OLD TWINE LOOSE; This will be your best guide. 7. When any given row of springs is completely tied, there should not be any slack in the twine at any point. 8. NOTE: Each diagram has the order of tying printed in the lower left corner of the page. Always follow exact order. Don�t get discouraged when it turns out to be difficult. IF IT WERE EASY EVERYBODY WOULD BE DOING IT. This is a skill that can take several years to master, but if you work hard, and are willing to take it apart several times, your first project can come out perfect. besides, you�re helping to preserve a dying art. Someday, someone will look at the work you�re doing now and say: "That�s the way they used to do it in the old days. "GOOD LUCK; if you have any questions please write. Used for furniture with loose seat cushions. This method is used first for tying Back to Front rows of springs. Then use Basic return tie for side to side rows and lastly use Diagonal Tie for both Diagonal rows. This results in an 8 way Hand tie. 1. Install springs with front row as far forward against frame as possible. This is the front rail of the frame. Remember to install the edge wire to the springs. Spring edge wire is wire rod that is installed with edge wire clips and pliers. Ask your suppliers or local upholstery shop. 2. Drive 2 nails in rear rail and 3 in the front rail for each row of springs. Stagger these nails to avoid splitting the rail. Drive nails at least half way in. Spring up nails really should be used. Drywall nails are really too big but have seen them used. the choice is up to you. 3. Cut one piece of spring twine for the first row of springs ( you will start with the center most row of springs. The length to cut is 4 times the distance over the springs from nails in back rail to nails in front rail. 4. Measure in from end of this measured and cut twine 1/4 of the total length. Wrap this spot twice around 1 nail in the rear rail. (center most row) Drive nail all the way in. 5. Starting with longer length of twine, follow diagram to tie knot 2 (number 1 is twine nailed to rail ). Remember All springs should be compressed by hand as knots are secured. All springs except ( front row) should stand straight up and down when you have finished compressing and tying them. 6. Tie knots 3, 4, and 5. Note: if you have 3 springs in your Back to Front rows then skip knots 4 and 5. 8. When you attach twine to nail at the front rail, you should pull twine tight enough to set springs at the proper compressed height. Average is 2" to 3" of compression. Ignore portions of springs that pop up as you pull on twine. When you have set the height, wrap twine twice around nail and drive nail all the way in. 9. Use shorter length of twine left at rear rail to tie rear return tie ABCDE This will level off rear springs. 11. 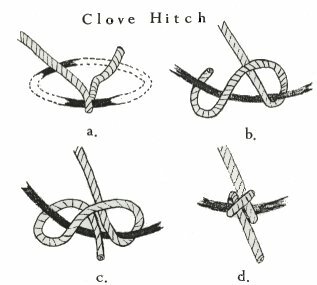 When tying G , be sure to tie a clove hitch ( you are tying away from yourself and must reverse method used to tie knot ). This tie (G) should be level off the front of this spring. 12. When tying H remember to compress front spring to proper height by hand. IMPORTANT: The distance you allow between knots G and H will determine if front edge of front spring and edge wire lines up flush with front face of furniture frame. Should only be this way. NOTE: Front spring is the only one that will lean out from standing straight up and down. 14. When pulling twine down to 2nd nail ( J ) ignore tilt of front spring. Measure from spring edge wire ( I ) to bottom of front rail down to level of webbing and set proper height at ( I ) using twine wrapped around nail ( J ) Drive nail all the way in. NOTE: The proper height at ( I ) is 1/2" taller than height of rest of springs in the Back to Front row. If springs are being tied to 8" height then I should be 8 1/2" tall to form a lip under front of cushion when item is fully finished. 16. When tying ( L ) pivot rear springs down to proper height, same height as other Back to Front springs. This will also pivot spring edge wire out to proper position which is flush with front edge of frame. 17. After tying ( L ) loop twine around knot 9 H ) before returning to nail at front rail ( M ) Be sure to check that front spring is not rubbing on any of the springs twine that passes through it, if it does, it must be re-tied and twine re routed or else the twine will wear prematurely. 18. Wrap twine around last nail ( M ) and drive nail all the way in. 19. Continue to tie all Back to Front rows before doing Side to Side rows. 1. Drive 2 nails into the side rail at each end of each row of side by side springs. Drive nails at least half way in. 2. Cut 1 piece of twine for each side to side row. Length: measure once over the springs (side rail to side rail) Plus 3 inches per spring for knots plus 30 inches for return ties (ABCDE) (15 inches on each end). This is intended to be very generous so that you don't run out of twine. 3. Measure 15 inches in from end of twine. Wrap this spot twice around the nail on the side rail (center most row). Drive this nail all the way in. 4. Starting with longer length of twine, just nailed down, tie "numbered" knots first. Diagram shows 4 springs. If you have more than 4 in your side to side rows add as many knots as needed to reach to the end spting and then refer to knots 8 and 9 and nail number 10 on the diagram. 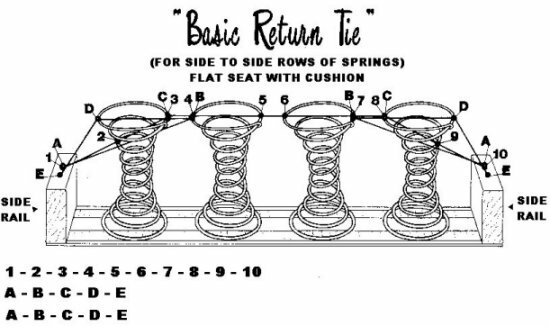 If you are doing a chair wht has only 3 side to side springs per row, omit knots 6 and 7 on the diagram. Note: The object of the side to side tie is to firmly secure springs straight up and down, but not to compress them any further. There should be no slack in the entire length of twine when you are done. 5. Tie both return ties (ABCDE) starting with either end to level off end springs. 6. 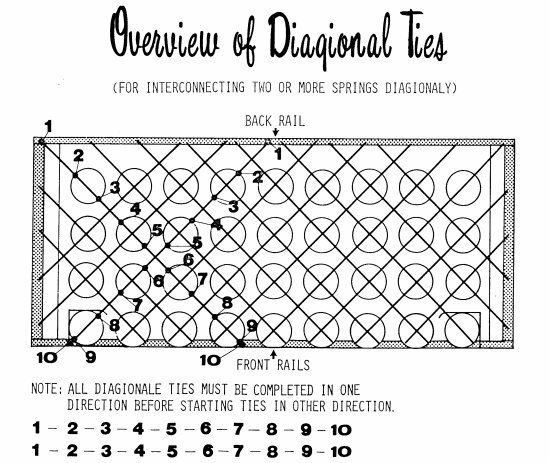 Continue to tie all side to side rows before tying diagonals. 7. Note: if 15 inch allowance on each end for return ties results in extreme waste of twine, use your judgement to adjust allowance and remember to adjust 15 inch distance measured in on twine to starting point in step 3 above. 1. Drive 2 nails into the rail at each end of each row of diagional springs. Drive nails at least half way in. 2. Cut 1 piece of twine for each side to side row. Length: measure once over the springs (rail to rail) Plus 3 inches per spring for knots plus 10 inches to have something to hold. (5 inches on each end). This is intended to be very generous so that you don't run out of twine. 3. Wrap one end of the the twine twice around the nail on the rail (center most row). Drive this nail all the way in. 4. Starting with twine, just nailed down, tie "numbered" knots. Diagram shows 4 springs front to back. If you have more than 4, add as many knots as needed to reach to the end spring. 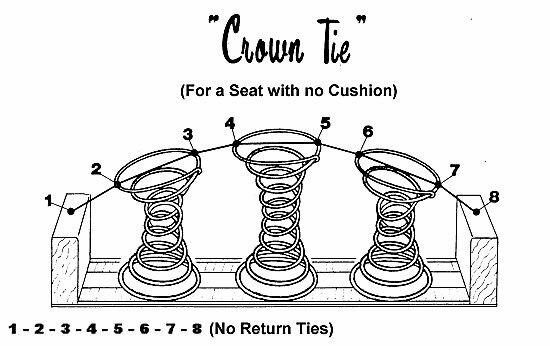 Crown tie is used for furniture that has a rounded or crowned seat without seat cushions. Small antique chairs are typical of this type of seat. 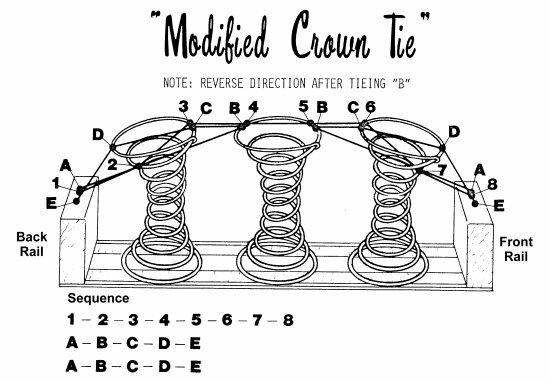 The crown tie can be used for Back to Front , Side to side, and Diagonal ties. 1. Always tie Crowned seat in the following order: First step: from back rail to front rail. Second step: side rail to side rail. Last step: Both diagonals. 2. Drive nail into frame at each end of row of springs. 3. Cut one piece of twine for each row of springs. The length: measure from the nail at one end, over top of the springs to nail at the other end plus 3" per spring allowance (for knots) Plus 12" to have something to hang on to. 4. Start at the rear rail ( center-most row of springs). Wrap end of twine twice around nail and than drive the nail all the way in. 6.Tie all knots and pull twine down to frame at front rail so that the highest point of the row of springs is compressed 2" -3". Wrap twine around nail and drive nail all the way in. 7. Tie all back to front rows to match. 8. Use the same method for side to side and diagonal ties. 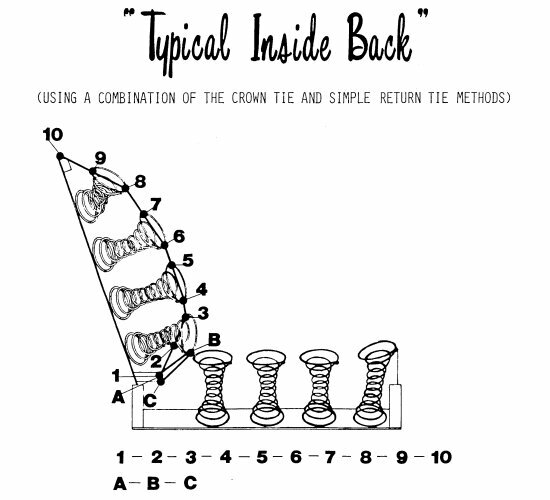 Modified Crown tie is simply using the Basic Return Tie method to achieve a crown shaped seat. It results in more control than using the crown tie. 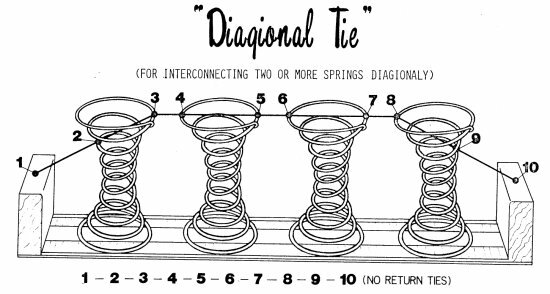 For instructions in tying , see Basic return Tie The only variation is that the twine is drawn down further at E on the return tie so that instead of the springs sitting flat they crown off at the edges D. The degree of slope can be more precisely controlled this way, than using the crown tie. Book containing the compilation of articles on upholstery, soft furnishings, Auto Trim, running a small business and more from 22 issues of our Professional Members Newsletters. These articles were written by past and current professional members of our site. If you are interested, just Click Here!